OK, so the title isn't exactly the Woodstock "Peace, Love, and Music," nor was the time of the year, nor was the weather . . . which would all explain why I took such liberties with it! For nine years, the HemlockFest has been putting on a three-day music festival in Dahlonega in order to save a species of tree called the Hemlock. This tree forms the basis of much of the Eastern Appalachian ecosystem and is part of the last old growth areas in the Eastern US. An insect called the Hemlock Woolly Adelgid (HWA) made its way to the Eastern US from Asia and has devastated much of the Shenendoah Valley and the Eastern Carolinas with its voracious appetite for the Eastern Hemlocks. Thank to the good folks at the Lumpkin Coalition, who put on the HemlockFest, work and research is going forward by breeding predatory beetles or bringing them over from the Western US Hemlock forests (if that is in fact a good idea - that's being tested, too), working with chemical agents in a safe and effective manner, and seeing in what areas the HWA is or is not feasting on our native hemlocks to track the devastation. There are dedicated people who are marching through the North Georgia mountains doing this work, both foresters and volunteers alike. I don't know whether the Georgia Conservancy is at work on this project; it sounds like something they might become involved in through their volunteer network. Might just have to make that inquiry myself. Back to the music. For eight years, starting in 2004, Webmaster Bill and I have heard about this festival, have thought of going to this festival, and have not gone. Yet. At the beginning of its existence, the first weekend of November was the height of my shop's winter season and there was no way that I was going to be able to spend three weekend days away from my business. Besides, it was November and it was cold and we didn't have any camping equipment. That all changed by 2009's festival, but then we decided it was too cold and we were having too much fun learning how to be at home and doing home-centered projects. But this year we decided we had to go, and so we packed up several wool blankets, a warm sweater each, hats, arm warmers, and nice, warm sleeping bags, and a small load of firewood. We hoped that the music would be good and the weather not too cold and that we had brought enough home cooked food and beer to enjoy the weekend. Turned out we did have to go into town for a few things but there you have it. Ice melts even in cold weather and sometimes batteries die at the worst times. We had heard there were some pretty big crowds and that everyone kind of parked their chair or blanket on the field in front of the stage and that was their "spot" for the day or the weekend, or even just for a single act. That spirit of camaraderie, of "We're all in this together for a common good," permeated the land and the people living on it for the weekend. And the music was everything we hoped for and a little more. The organizers brought bands in from all walks of musical life: blues, mountain music, coffeehouse music, local bands, and straight up rock and roll. There was young (like, teenage young) Lara Polangco who sang on Sunday morning a strong combination of her own compositions, guitar-inspired playing from her hero Stevie Ray Vaughan, and pulled off Billie Holliday. Really. The Goddess of Blues herself. There was also one of our favorite bands, Emerald Rose, who helped open the program on Friday afternoon with their combination of Celtic-American folk rock (I know, that's right from their web page, but that description says it best). We stayed up late Friday night wandering the grounds of Starbridge and listening to an impromptu folk session around a campfire that included ukeleles whilst stargazing in the cold mountain air. Saturday we listened to Gibson Wilbanks, who won Eddie's Attic Songwriter's Open Mic competition in late 2011, and were blown away by the strength of their voices and the variety of music. Blues, folk, and a mean electric guitar. Later that afternoon was Lil Al's Soul Funk Revival that included some real soul music (as in, honest-to-goodness Motown soul), great guitar playing, and damn if they didn't launch into Jimi Hendrix's rendition of the "Star Spangled Banner." Yes, we stood, as did several people on the field; you're supposed to stand for your national anthem, you know. And they pulled it off, getting the sounds and feedback that mark this version. And friends had mentioned that we HAD to be present for Ralph Roddenberry, a straight-up rock and roll band. Man, they weren't kidding. I had not heard rock and roll played with such professional sounds, especially original rock and roll, in a long, long time. It was a little hard to see the stage by this point in the evening, since everyone was up in front of the stage dancing (which the crowds all weekend had asked them to do! ), but we eventually found some space in between bodies just as the band, with some guests, launched into a slow riff that sounded vaguely familiar. Webmaster Bill and I looked at each other as recognition dawned, and we said to each other, "They're going there!" And they did. And it was awesome. And do you know what the riff was? "Whole Lotta Love" by Led Zeppelin. We heard it live! We heard it performed live, and slow (and it's a slow riff - listen to the song next time it's on the radio), and we heard it performed by master musicians who were jamming and paying homage, all at the same time, to this old, revived blues riff. Cuz really, that's what it is. But to hear a strong voice with all of the talent of Robert Plant, and a strong guitar player re-birthing Jimmy Page's turn of phrase, took our breath away. We felt connected to music again in a way we haven't in a long, long time. So if your life's journey takes you to the North Georgia mountains the weekend after Halloween, camping being optional, day passes available, and you just want to hear some music to revive your soul, to renew your hope that good, original music is still out there but you don't know who the bands are any more, then reserve some space on next year's calendar for the Hemlock Festival. You'll leave knowing you helped save the hemlocks and spent some time rejuvenating yourself. And while you're rejuvenating, there's plenty of time to work on your needlework projects. 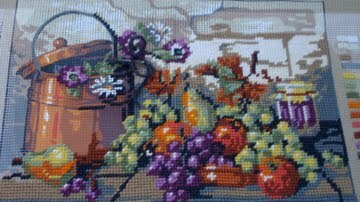 In my case, I wanted to get farther along on the Iris Needlepoint and I did. In fact, I was worried that I might finish it before the Festival was ended!